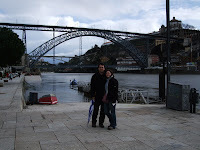 Porto is the known as the unvanquished city and the capital of the north. It sprawls on the northern bank of the Douro river, out to its estuary at Foz and on someone elses tourist euro, we have eaten well, drunk well, visited things we wouldn't have visited and generally had a lovely holiday - thank you Daddy! Porto, originally a celtic settlement called Cale which pre-dated the Romans, is one of the oldest cities in Europe. Through the marriage of the first king of Portugal with the house of Lancaster and the Treaty of Windsor in 1386, England and Portugal have the oldest international alliance in the world. As a sea-faring nation, Portugal's empire rivalled that of England, and Henry the Navigator, who later went on to discover places like Brazil, Goa, Mozambique and Macao, was born in Porto. The citizens of Porto are known as Tripeiros (Tripe eaters) as during a sea campaign to Africa, the people of the town gave all the meat to the sailors, leaving themselves with only tripe to eat. Our journey to Porto was largely uneventful. As Will wanted to fettle on the laptop, I was allowed the drive, the first time I have done so on foreign soil. I had been quite happy driving Jules around in the UK, right from the first day we bought it when it was a choice of driving home down the A14 in the rain in the midget which had broken windscreen wipers or my new and unknown van which had working windscreen wipers (of sorts). I opted for visibility :) We bonded from the first and all was well, even the left hand drive-ness didn't feel odd (well except for one occasion on my second or third trip out when, having stopped concentrating quite so hard, I put my foot on the clutch to change gear, took my left hand off the wheel to reach for the gear stick, actually reached for the gear stick with my right hand, and suddenly wondered which hand was steering...). still, we found the hotel and the requisite parents and all was well :) And, with help from my mother, the packing queen, father christmas had also visited (he didn't find us in our little van, presents addressed to "Jules, The Campervan with Daisies on, Europe" and the bbq being on the roof in lieu of a chimmney not being enough guidance for him!) 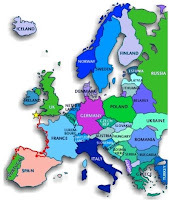 So we are now equipped for further travels with; LPs for Scandinavia and Eastern Europe, as well as the required phrase books (we just have to actually get there now! ); two new china campervan mugs which replace the one of Will's which I broke (an unrequested surprise, apparently I am not allowed to touch them which suits me fine, Will can wash them up :) ); four new plastic campervan mugs, two of ours having inexplicably split when making tea in them (and therefore replaced by Just Kampers, no quibble); new gloves all round (we shall probably loose one of each in due course but we now have plenty to chose from! ); the new laptop battery, all the way from china via Hong Kong to Cambridge; the lpg gas adaptor; a whole library worth of books to keep me entertained, christmas cake and chocolate pennies (wouldn't be christmas otherwise!) and 160 tea bags, packed into all available spaces. I am reasonable sure that tea smuggling is not actually a crime but it is a good job she wasn't stopped by customs as there were clearly far more than could be believably justified as 'for personal consumption' and as they were all sensibly bagged up in little sealy bags to keep them dry, they were all too obviously for dealing by some master criminal, no one would mistake my mother for anyone's mule... ;) at the present moderated rate of consumption we probably have enough to keep us going until we come home - whenever that might be! It being late-ish by this point, we parked the van near a nice quiet park near the hotel and set off to find the restaurant recommended by the hotel reception. From the outside it wasn't promising, looking like a tatty caff as it did, but inside was better, it smelt nice, and as we were seated, we were promised a waiter who spoke english - which he did, after a fashion... His tactic was to describe the dishes in portuguese, repeating himself more slowly and more loudly until we got it - I know it is an old cliche but it does actually work! - and then to point at what he thought you should have saying "iss good, iss very very good" until you gave way and agreed with him. Two portions of octopus and prawn skewers, two protions of bacalhu (portuguese salted cod) with mayonnaise and fried potatoes, four different deserts (one of which, Will's translator programme told us was camel - we think it meant caramel :) ) and a bottle of lovely local wine later, we had to concede that he had indeed been right to insist! The next day was new years' eve and with the weather forecast indicating showers, so we set off into town in search of Porto cards (one day travel card things with access to museums and other things) and things to see, do and go to. we found ourselves heading back out into town in search of fireworks at 11ish. The streets and metro were surprisingly quiet given the festive occasion and even as we neared the main square where things were supposed to be happening, it wasn't that busy. It was still crashing down with rain every now and then so most of the way was lined with dark figues huddled under every available shop front or building overhang which was a bit odd to see. However we got to the square and found the big stage with lights, a cheesey compere and the requisite dancing girls wearing very little. The music was very "swing your pants" (a target reference for anyone on board who grew up with 80's saturday morning TV - you know what I mean... :) ) but the surrounding audience seemed to like it and be joining in and the occasional rain showers resulted in some seemly ochestrated umbrella up-ing and down-ing :) nearing midnight however the sky was clear. The band stopped surprisingly promptly and everyone was just hanging around when we noticed people suddenly putting ummbrellas up which seemed a bit odd as it was dry, until suddenly the count down begun and everyone popped and fizzed their champagne everywhere - rain of a bubblier kind! We had bought some horribly cheap Cava to celebrate the occasion but hadn't felt festive enough to drink it before coming out and hadn't thought to bring it as in the UK it would have been confiscated immediately as a riot hazard, but here in Porto, it was all very jolly, no one was out of control drunk and there was no question of trouble - it was all rather nice. Fireworks from the top of the town hall were good (although some of them weren't quite aimed right and were bouncing off the clock tower!) but the only "ooh-ing and ahhh-ing came when suddenly the heavens opened again and all the umbrellas went up in one concerted gust - was a lot of fun! Belated happy 2010 everyone! It was actually surprisingly nice, and open, so after a wander on the beach to watch the news year's swimmer and see the cheese castle, the open view allowed us to anticipate the coming rain storm so we ducked in for some lunch. Planning to eat in the evening, this was only supposed to be a snack lunch so we ordered two Francesinas and two mozarella salads between us - with some delicious Super Bock beer (apparently the only thing to accompany such a meal according to the waiter, another of those brilliant "I will tell you what you want until you agree with me" types). Like salt cod, francesina was also in mum's illustrated guide book as "a typical thing you should eat" - who are we to argue! - and is the ultimate in toasted sandwich; pork sausgae, roasted port, ham between two slices of toast, topped with prawns (in this version) topped with melted cheese, covered in piquant tomato sauce - looks unpromising, is actually surprisingly delicious! and filling! To walk off lunch, we headed to the city park across the way for a nice long walk and then set off once more in search of a sunset, lighthouse and cup of tea end to the day at the other end of the beach where Douro meets sea. The roads were surprisingly rush hour like busy but we managed to score a brilliant sunset, light house view parking spot and set off once more for a walk up the breakwater. The waves were fantastic, crashing up five or six feet up above the wall much to the shreiking amusement of all who were trying to either dodge or photograph them - lots of wet, salt water fun all round! To avoid the traffic, we walked to the actual light house - old, out of use, shut and soon to be the recipient of some restoration grant money but not yet, and decided to sit in the van for a cup of tea whilst everyone else went home - or at least this was the plan, until a little battered white van pulled rapidly in behind us and stuck its bonnet up. Will looked at them looking at it for a while but was unable to resist going to have a look, only to discover that the problem was that the hose at the bottom of the radiator had come off and therefore all the water had drained out. It didn't look like the van had ever seen much mechanic time and the guy looking at it also didn't seem that handy (he sent his wife for water to refill it and she came back with two 500ml bottles of mineral water - bless.) so Will stepped in and took over operations. They didn't speak english (although we later discovered they had a little french) and the hose, which fortunately only needed re-attaching, was in a really awkward place but they didn't bat an eyelid at some foreigner turning up with a bunch of tools who started taking panels off their car... Between dad and Will, and after about an hour of cursing, the hose was reattached and it was discovered that the fan never worked anyway so there was no point in hanging around and running the engine to get it up to temperature (when the fan comes on) to check everything was ok as you would never know (probably the reason why the hose came off in the first place!). They tootled off and hadn't broken down again whilst they were still in sight so all good! As well as liking to help people and to get his hands dirty, Will is offering to help anyone we see with car trouble in the hope of building up our Breakdown Karma (or Busma as I am calling it) in the hope that someone will do the same for us if (when) we need it. They also pressed enough money into Will's hands to by us a nice bottle of port and when we were finally ready to leave, there was no longer any traffic - brilliant! Guided walk round town day. We had bought a book with 4 self guided walks on different themes (mediaeval, baroque, neo-clasical and tiles or some such architectural things) but on discovering that they were all overlapping, Will had spent an hour in the bar the previous night transposing all the points on the one map and joining the dots :) and so a nice and not too wet day was had seeing things which are described elsewhere - particular unexpected highlights, for those who don't fancy reading elsewhere, being Palace de Bolsa (stock exchange) with unexpected free wine tasting and the "Clive Alive" volvo car safety video as told by a particularly chirpy devil-may-care volvo crash test dummy called Clive. Apparently "Crash test dummies live longer a Volvo" - you-tube it, it must be there, its brilliant! Probably too cold in Dec/Jan but the smell of the Port process.....Heaven. Great reporting as usual and a special honorary 'third emergency service' badge for hose refitting. Half a week and half a country away.